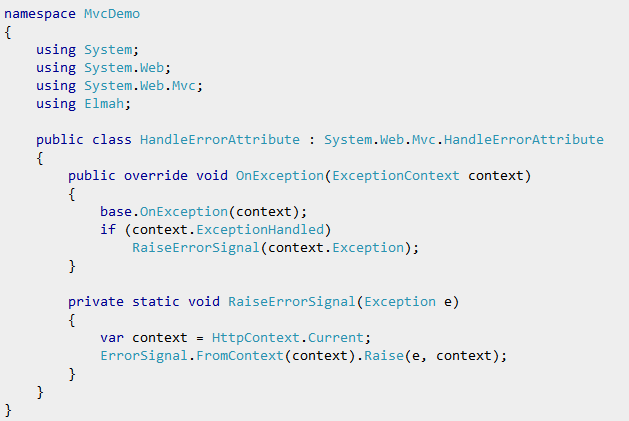 In ASP.NET MVC (versions 1 to 3) we have the [HandleError] attribute, that will allow us to handle errors in a very easy way. Just by decorating an action (or controller if we want to extend HandleError behaviour to all actions on that controller) with the HandleError attribute and enabling “CustomErrors” in web.config, we get a nice redirection to a friendly view in case an unhandled error raises. As we can see, the unhandled exception will be handled if it hasn't been already marked as "handled" and if custom error handling is enabled . · RemoteOnly: if we launch the application in the local server (targeting http://localhost ), we won't see custom errors. If we access the application from other machine, we will see custom erros. This option is used by developers to debug applications. If there is an error, you can always (among other things) RD to your server and launch the application in a local browser so you see the exception in a first seat. Important: ASP.NET MVC3, registers the HandleError attribute globally (for all controllers) !! (see image). 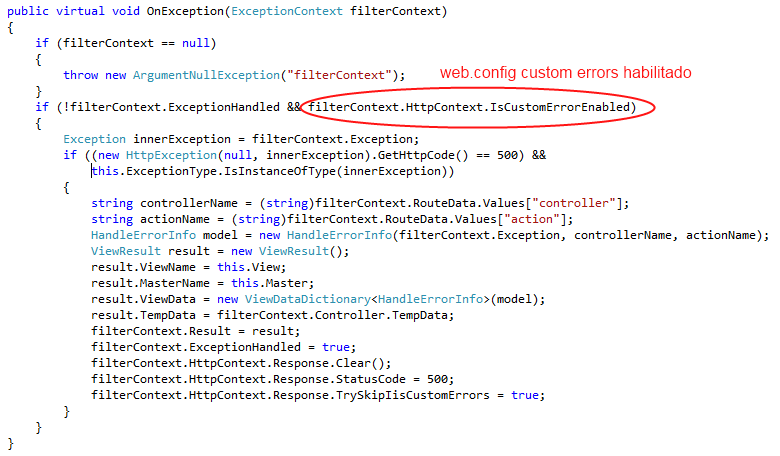 Take that into account so you don't think your MVC3 controlleris not using the HandleError attribute (by default it is). 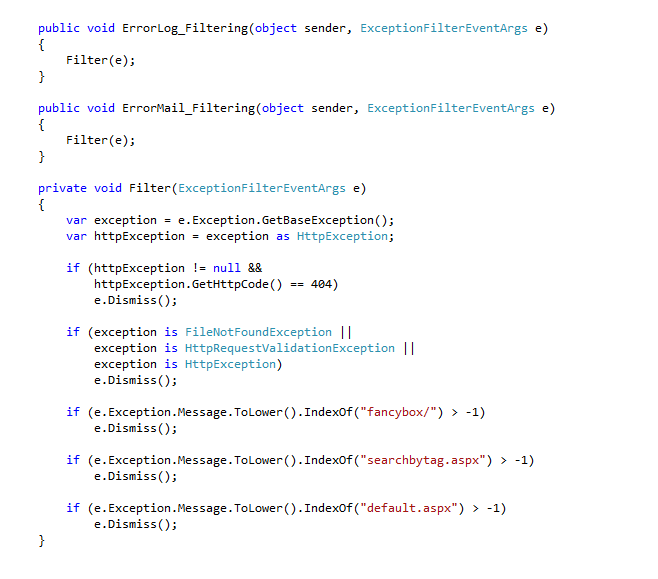 In previous versions of ASP.NET MVC, where we didn't have global filters, the HandleError attribute had to be defined manually for each action or controller. Also important: If you have enabled CustomErrors=On , also added the [HandleError ] and still get a yellow screen of death please make sure the Error.aspx has no errors (check master page and the errors.aspx code) , it may have an error (this is pretty common scenario and difficult to debug).You can check if this is happening simple by temporaly removing all Error.aspx code and replacing by a text (más información). To avoid showing ASP.NET yellow screen of death if your Error.aspx has errors, use "redirect" CustomErrros attribute to show a static html page. Alternatively to HandleError, we can also override the OnException method of a controller (or all of them if we use a base controller class). 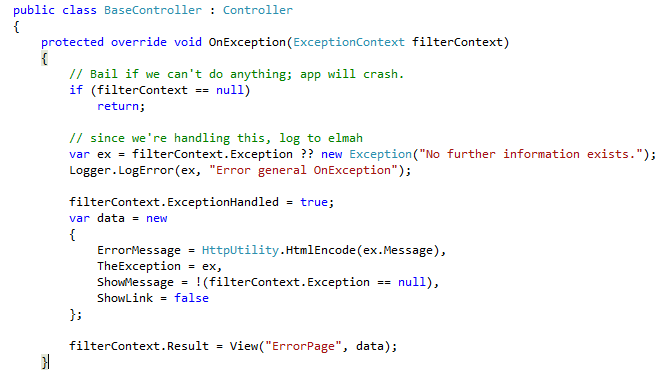 Note: the OnException event is executed independly of the use of HandleError in the controler. Elmah is a fantastic library that help us to intercept, register (in the desired format: database, text file, xml, etc) and optionally deliverunhandled errors ocurred in our application, so we keep everything in control at all times. It also provieds a web interface so you can access the error records remotely, and a RSS feed so you can subscribe with your favorite RSS reader. And that's it.. When an unhandled error is raised, Elmah will be able to intercept it and record it, and also send an email to the administrator. Elmah works perfectly with unhandled exceptions (yellow screen of death), but won't be able to intercept exceptions that are being handled by the [HandleError] attribute. To fix this, we need to create a custom HandleError attribute and add a custom behaviour to the new attribute. If Elmah is logging too many stuff, (ex: 404 errors looking for favicon.ico), I have the posibility of applying custom filters to those unwanted events . In my particular experience, I found the best practice to use the custom HandleError as shown in the last part of this article (having the HandleError applied globaly) with CustomErrors enabled, helped by Elmah to handle, register and send unhandled exceptions . When necessary, I use the Elmah signal capabilities for those handled exceptions I want to log. Everybody knows Razor is the new view engine ASP.NET Web Pages, so I thought I’d write about some Razor syntax you may not be aware of. The three methods I’ll be focusing on today are RenderBody, RenderPage and RenderSection. You’ll need to understand how each of these work if you want to get know the Razor syntax intimately. This code also works in WebMatrix if you're using it. 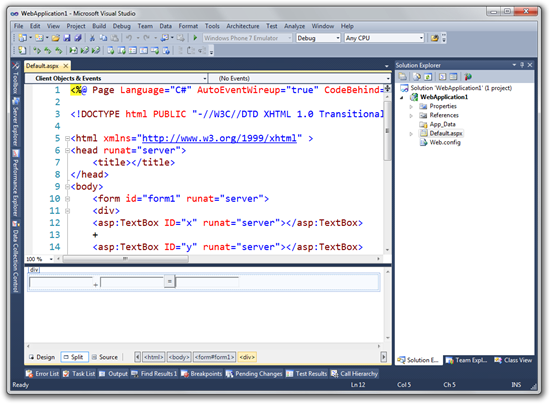 Open studio 2010 and create a new ASP.NET MVC 3 Web Application (Razor) project. Now it's time to start coding! I’ll begin with the RenderBody method. The RenderBody method resides in the master page, or in Razor this is commonly referred to as the Layout page. There can only be one RenderBody method per Layout page. If you’re from Web Forms world, the easiest way to think of RenderBody is it’s like the ContentPlaceHolder server control. The RenderBody method indicates where view templates that are based on this master layout file should “fill in” the body content. 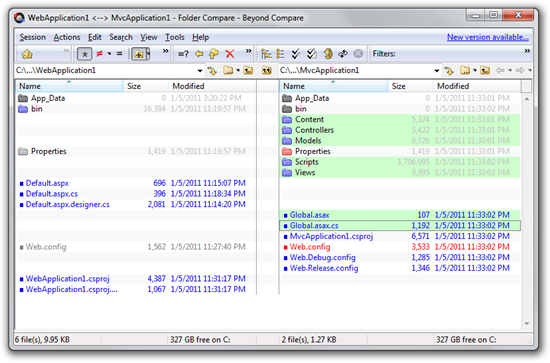 Layout pages can also contain content that can be filled by other pages on disk. This is achieved by using the RenderPage method. This method takes either one or two parameters. The first is the physical location of the file, the second is an optional array of objects that can be passed into the page. Add a new cshtml file to the Shared folder and call it _Header.cshtml. I've prefixed this file with an underscore because I don't want this file to be called outside of RenderPage. 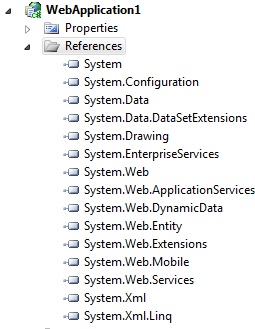 By default, ASP.NET will not serve pages beginning with an underscore. Here's the code I'm adding to the _Header.cshtml page. And to use this in the layout, it's as easy as this. Layout pages also have the concept of sections. A layout page can only contain one RenderBody method, but can have multiple sections. To create a section you use the RenderSection method. The difference between RenderSection and RenderPage is RenderPage reads the content from a file, whereas RenderSection runs code blocks you define in your content pages. The following code illustrates how to render a footer section. RenderSection expects one parameter and that is the name of the section. If you don’t provide that, an exception will be thrown. Views can add data to sections by using the following code. If you ran the website now it’ll run without error. 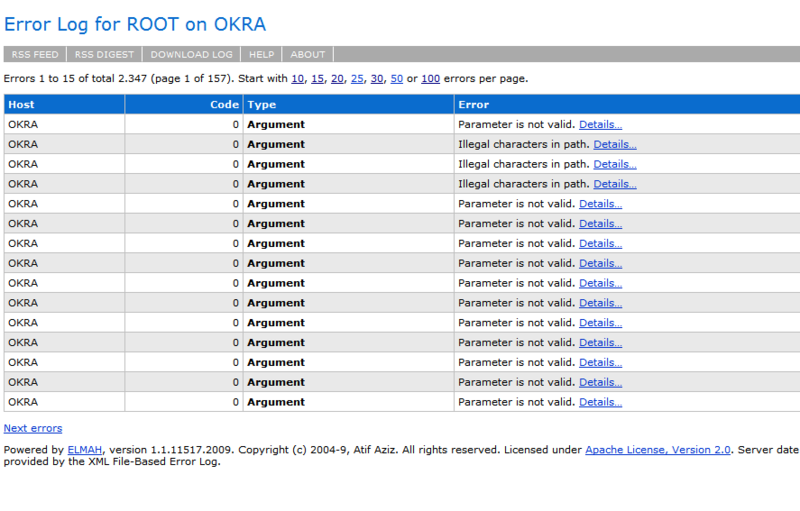 If on the other hand you don’t include the section footer in the view, you’ll get an error. That’s because by default, sections are mandatory. To make sections optional, just add the second parameter, which is a Boolean value. Now things will run just fine. These three methods you will use time and time again when you're using the Razor view engine. 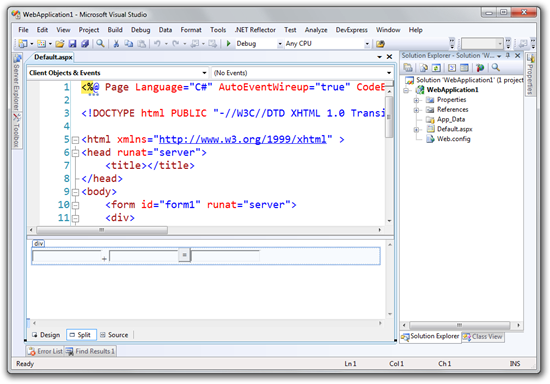 This code works both for ASP.NET MVC 3 and also WebMatrix. Have fun! Then click Next until Finish. 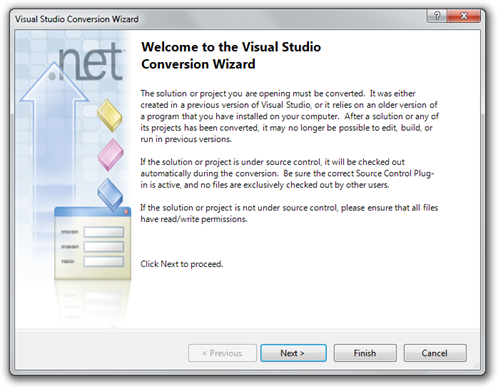 You will get prompt to upgrade the 2.0 application to .NET Framework 4. Click Yes. 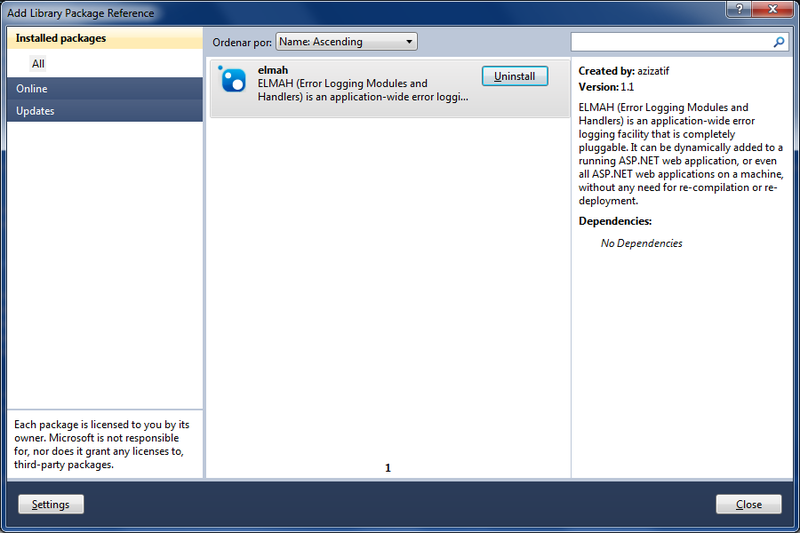 Here's the same WebForms application, now upgraded in Visual Studio 2010. It still runs and it's still WebForms. 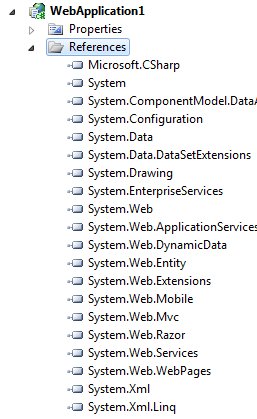 Or, more accurately, it continues to be ASP.NET. 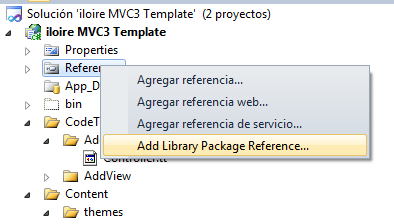 I'm going to take a new default ASP.NET MVC 3 application and Beyond Compare and compare the upgraded app with the default app. Now, here's the before and after references from the upgraded application. You’ll see the old one on image_6 and the new one on the image_7. Here's the references I added. Next, add these sections to the Web.config. Again, it's easier to use a diff tool and you might have a little trial and error. And finally add this assembly binding redirect, just in case you've got ASP.NET MVC 1 or 2 assemblies in your Global Assembly Cache (GAC). Also, make sure you merge in the Global.asax.cs so that your Routes are registered at application startup. Now, at this point I can visit both pages. The WebForms page is a file on disk, so ASP.NET routing passes requests directly on to this page when I /default.aspx. The ASP.NET Routing engine is engaged so I can also hit /Home/Index. Now I can visit /Calculator and the request is routed to /Default.aspx. 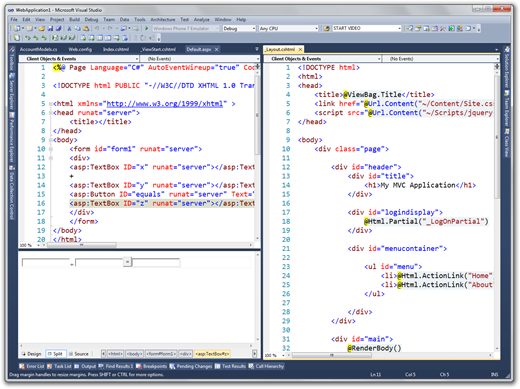 And of course, my ASP.NET MVC 3 Razor pages like /Home/Index work also.